The new Behringer mixers are only a drop in the ocean of new music products featuring some form of iPad integration being showcased at the National Association of Music Merchants (NAMM) Show, happening now in Anaheim, California. 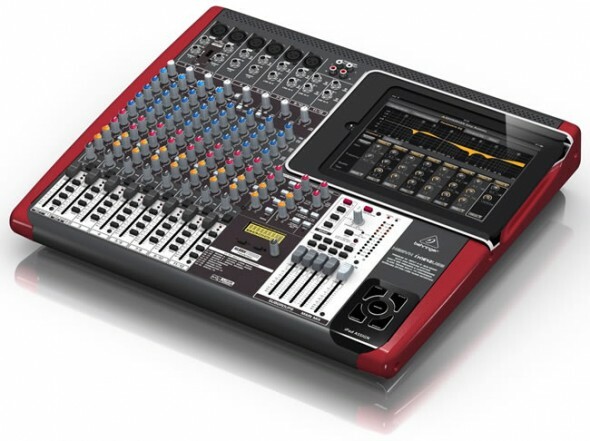 January 18, 2012 Bothell, WA – Just in time for the 2012 NAMM Show, BEHRINGER unveils three small format premium mixers that directly interface with the ever-popular iPad. Drawing on the power of the most ubiquitous mobile digital device, the XENYX iX Series mixers are designed to handle live performance and provide state-of-the-art tools to create professional recordings. Users can also sync performances to video by utilizing the iPad‘s video out capability. The new XENYX iX Series, which include the XENYX iX3242USB, iX2442USB and iX1642USB, feature a built-in iPad docking station designed to send signal to and from the iPad with a wide range of routing options. The innovative feature set included in the new XENYX iX Series USB mixers makes it possible to record and mix on a professional level thanks to the built-in, stereo USB audio interface. Connect these mixers directly to a PC or Mac computer via a single USB cable to record any signal source connected to the mixer. All iX mixers include the new dual-engine KLARK-TEKNIK FX processor with 32 editable, studio-grade presets such as reverb, chorus, flange, delay, pitch shifter and multi-effects. In addition to literally thousands of apps, the iX mixers use the iPad to control the new KLARK-TEKNIK FX Processor App, enhancing the mix by allowing the user deep control of EQ’s, compressors and reverbs and a full spectrum analyzer. The iX series mixers also feature high performance XENYX mic pre amps, which represent a major step in the evolution of audio technology. Comparable to far more expensive, stand-alone mic preamps, XENYX preamps offer a staggering 130 dB of dynamic range, with a bandwidth that extends from below 10 Hz to 200 kHz for transparent, crystal-clear performance. XENYX mixers’ 3-band channel EQ is based on the same circuitry used in British consoles that allows users to create signals with incredible warmth and detailed musical character. Additionally, “one-knob” compression is available on all mono channels. Dial in the perfect amount of compression for instruments and vocals, creating powerful mixes with punch and clarity.